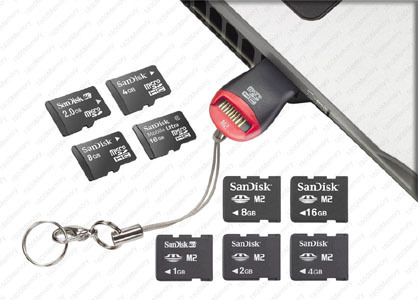 Designed for all mobile phone memory cards (microSD, microSDHC, Memory Stick Micro M2). Support all memory card capacities from 128MB to 64GB. Hi-Speed USB 2.0 compatible transfer rates. No additional card adapters required. Compatible with Windows Vista, XP, 2000 and Mac OS X.